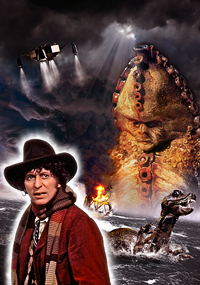 The illustration for 'Terror of the Zygons' came together quite easily once I'd satisified myself I could source the necessary images to achieve my desire of having the Skarasen appear. Broton was a given, and there are plenty of photos of him, but I wasn't sure I'd be able to include the Skarasen. I had hoped there might be some nice photos of the model creature in the DVD's photo gallery, and while one was included in the making-of feature, it was rather dark. As it happened, there were more shots in the episodes themselves than I'd remembered so i was able to take some screengrabs and compile him from those. In the end one paw came from the still photo. Beyond that, it wasn't until I came to design the cover that I thought about how actually to include the Skarasen: swimming in Loch Ness, crossing the moor? Having him in the water would allow me to mask any missing bits of his body, so then it seemed obvious to have him swimming away from a collapsing oil rig. I did search for genuine rig photos but felt they all looked too modern, so in the end screengrabbed the model in Mr Huckle's office so the illustration would be accurate to the programme. I then had great fun demolishing it and blowing it up (visually speaking). Merging the black smoke into a doomy sky seemed appropriate, with Broton overseeing all through his beady little eyes. Finally, the shot of the Doctor is actually from 'Robot' but I didn't particularly want him in his Scottish accoutrements, as he only wears them briefly, and this pose just fitted the layout so well. My thinking about 'The Face of Evil' began with a desire to be contrary. Most covers I've seen feature the Doctor's face carved in the mountain - usually recreated (not always convincingly) rather than using the model from the programme - and while I had a medium sized photo of the model that documentary maker Chris Chapman had posted on Twitter, I really wanted to do something different to the norm. 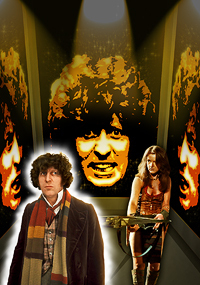 Given the title of the story, however, I felt it did need to feature a face, so I hit on the idea of recreating the screens from Xoanon's chamber, with a grimacing Doctor/Xoanon looming over the real Doctor. Part of the inspiration was that I knew of a good front-on shot of Tom gritting his teeth from 'The Masque of Mandragora' that I thought would be perfect, and indeed this is what I used. I had intended to simply distort the same photo for the side screens, but came across a similar shot with Tom in three-quarter profile that I figured would work better, suggesting the faces were more 3D than 2D and helping with the sense of perspective. The rest of the room was created from scratch, being simple shapes. I had thought to have only the Doctor in the foreground, in the centre, perhaps succumbing to Xoanon's onslaught. The best photo of him I could find, however, didn't have as pained an expression as I'd hoped, and worked better to one side, which also fitted with the face screens better. With no decent photos of any of the Sevateem, and only one of the Tesh in a suitable pose but far too low-res, I had to go with Leela. 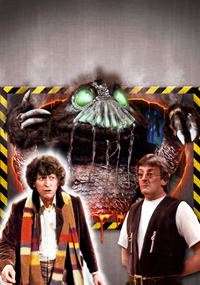 Companions rarely get to feature on my covers, having started out with a style that favoured villains and monsters, but I justified it to myself here as there is a scene where, under Xoanon's control, she attempts to stab the Doctor. While there are plenty of shots of her brandishing a knife, they didn't fit the layout as well as this one of her with a crossbow, so I took some artistic licence. The Mandrels were always going to feature prominently on my cover for 'Nightmare of Eden' as I'm rather fond of their look - at least in photos; admittedly they're less effective on screen, although I think they could have been a lot better with some proper choreography of the extras inside the costumes. The natural pose of a Mandrel is, of course, arms raised and going "Raarrgh! ", so I hit on the notion of having one bursting through the wall, kind of like at the end of episode one. Beginning with creating the wall itself, I then cut out the hole but my attempt at having pieces flying out towards the viewer wasn't at all convincing, so I stayed more accurate to the programme and had the hole as if cut out by K9's laser, giving it molten edges for added effect. For the Mandrel itself I had hoped to use a mix of shots to create a new pose, particularly as I didn't have room for his arms to be flailing too widely and ideally wanted him face one, looking straight out of the picture at you. Again, lack of sufficient quality images meant I had to use mainly one rather familiar shot, but its limbs were rearranged to better fit the space. As I've done several times in the past, Tryst was composed of screengrabs from the episodes, combining a mid-length body shot with a more detailed close-up of his face. The Doctor also had a new head in the end as this body pose had Tom grinning broadly. The head is actually from a 'Shada' photo but the expression was just perfect.